It took me exactly 14 days to write this 97,500 word masterpiece. The editing took about that many weeks. I took seven years of music lessons and the only thing I can somewhat passably play on the piano is Yankee Doodle, hence its appearance in the book. The scene where Paul tries to annoy Liberty by talking in the third person, “Paul’s hungry. Paul had a good day. Paul went to blah, blah.” was actually written as a way to deal with the craziness in my own life at the time. My eldest son could only say about six words or so by his third birthday He’s not autistic and has no other reason for a speech delay, he just has one. Anyway, a few months after he turned three, he started talking more, which was great, unfortunately, it was in the third person! Eddie hungry. Eddie not tired. Eddie green (when choosing a pawn for a game). I was so excited he was speaking that at first, I let it go and started using pronouns more and making sure he knew I was using them. But after a few weeks, it didn’t stop. The speech therapist said it was normal and wouldn’t last much longer. It lasted nine months! Yes, nine months, he talked in third person. We tried everything to get him to stop, but the speech therapist was right, he stopped when he was ready. I started writing this book out with a pen and paper while on a camping trip. The same trip where my husband was reading Intentions by firelight (even more irony, it was the night of the lost page). I was right next to him in a camp chair with a pen and a pad of paper I swiped from a hotel scribbling out the bathtub scene. I detest the name Paul (my apologies to anyone out there with the name, named their child that, are married to a man with the name, have a relation to a Paul, etc). My hatred stems from my middle-school years when I experienced not only verbal but physical bullying at the hands of two kids–one named Paul and the other (oddly enough) named Jon (no H). I used the name because when I introduced him in Intentions I wanted to give both Paul and John biblical names. Plus, for the purposes of the title, it fit, so I did learn to like the name well enough and now when I hear it, I think of this sweetheart hero and not one of my childhood tormentors. Most people use the names of those they hate as the villains and enjoy torturing them, I did the opposite. I tried to make a positive memory attached to the name and it worked. My original plan for Liberty and Mr. Daltry didn’t stop where it actually stopped in the book. I thought she’d actually sleep with him, then be physically sick with regret and worry and in her attempt to rush out of bed and the a chamber pot to cast up her accounts she’d uncover Paul’s scar. But that wasn’t very true to her character. I think she already knew she loved her husband and don’t think she’d have “cheated” on her husband with her husband. I also thought if she did that, it’d only create more of a trust issue between the two. Never in a million years did I imagine that Alex’s comments about hedgehogs would become so popular! I just put that in there as a comical diversion, but for some glorious reasons, hedgehogs (and love muskets, I’m afraid) will forever be remembered by my readers affectionately. I may or may not have been caught by my husband doing a Google search for fun/unique names for a man’s…love musket while trying to think up a fun name. I’d almost decide on wedding tackle, but then came up with love musket. Halfway through reading my first book, my mom emailed me to ask if my middle name was Liberty due to my willfulness at times. 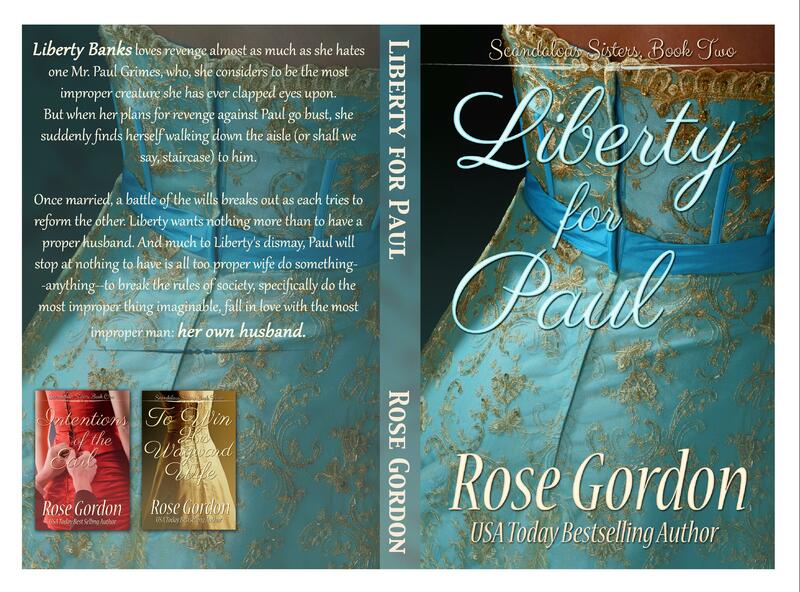 A chapter or two later, she texted to say that Liberty needed a spanking! Ironically, the last time I checked, she said this was her favorite book. So two different boys that made my life miserable while growing up by both verbal and physical bullying were named Brandon. Good thing I don’t keep a grudge either. I’m glad you were able to redeem the name Paul. Indeed! Glad you found a positive for the name Brandon! You wrote this book in 14 days? Oh my stars! Love musket. It makes me giggle. Well…I didn’t have much of a life. I didn’t have Facebook, a website, blog, or a full-time job (other than being a mom) so I had more time. I also knew exactly where the book was going, so when I’d get on the computer in between rounds of CandyLand I’d pump out a chapter in no time.